Day 1: Pick up and transfer to Kasese the foothills of the Rwenzori Mountains.We will stop at the equator crossing enroute for a photograph one feet in the South and one feet in Northern Hemisphere.We will then head to Mbarara for Lunc an the Lake View Hotel before finally driving to the foothills of the mountains of the Moon. We will Check in at the Margarita Hotel for dinner and overnight.The rest of the day shall be spent acclimatising to the climate. 5-6 hour Climb into the Mountains. You will climb through the thick vegetation arriving at the Nyabitaba Hut(2650metres) in the late evening for dinner and overnight. Sharfer Bridge to marvel at the Mobuku River Confluence. A Climb through the Open Patches and Lobelia and the Heath Moss Forest before proceeding up to the John Matte Hut for overnight. Day 4: Depart early through the Giant Lobelias and the Heath trees. Groundsels. Dinner and overnight at Bujuku Hut (3977) Hut. Glaciers. Scale further to through the Scott Elliot Pass(4372m) and proceed through the Snow to the Elena Hut for Overnight. through the Snowy Alexander Peak (5092m) and the Highest Peak (5109m). to Guy yeoman Hut for dinner and Overnight. Day 10: Break fast at leisure and transfer back to Kampala / Entebbe. -Day pack warm gear including jackets, hat, thermal under wear, cotton stockings and any other from your hiking experience on snow. The 120km Rwenzori chain is regarded to be the legendary snow-capped Mountains of the Moon, described by Ptolemy in AD150. Reaching an elevation of 5,109m, it is also Africa’s third mountain after Kilimanjaro and Mt Kenya,this mountain range, exceeded in altitude only by the free-standing Mount Kenya and Kilimanjaro. The distinctive glacial peaks are visible for miles around, but the slopes above 1,600m are the preserve of hikers, who rate the Rwenzoris to be the most challenging of all African mountains. A variety of large mammals inhabits the lower slopes, but the Rwenzoris are notable more for their majestic scenery and varied vegetation. The trails lead through rainforest rattling with monkeys and birds, then tall bamboo forest, before emerging on the high-altitude moorland zone, a landscape of bizarre giant lobelias, towered over by black rock and white snow, looking for all the world like the set of a science fiction film. t zone; many more are expected from this zone. Two trees are found only in the Rwenzori (Hypericum bequaertii and Schefflera polysciadia), and seven others occur only here and in the other montane forest zones of south-west Uganda, namely Senecio erici-rosenii, S. adnivalis, Erica kingaensis, Philippia johnstonii, Vernonia adolfi-friderici, Ficalhoa laurifolia and the nationally threatened Ocetea usambarensis (V) (Howard, 1991). Knowledge of the fauna is skewed in favour of the higher altitude species. Overall, the mountains contain at least 89 species of forest bird (27% of the country’s total), 4 species of diurnal primate, and 15 species of butterfly (22% of the country’s total) (Howard, 1991). Although none of these species are unique to the Rwenzori, many are endemic to the Albertine Rift region (for instance 19 of the birds are Albertine Rift endemics), and a high level of sub-specific endemism occurs, including the Rwenzori colobus monkey, hyrax and leopard. A recent study of invertebrate life forms listed 60 species in the alpine zone, 25 of which were new to science (Salt, 1987). This is indicative of a much more extensive fauna waiting to be discovered. Although in low numbers, the following globally threatened speciesare found in the park: elephant Loxodonta africana (V), chimpanzee Pan troglodytes (V), l’hoests monkey Cercopithecus l’hoesti. 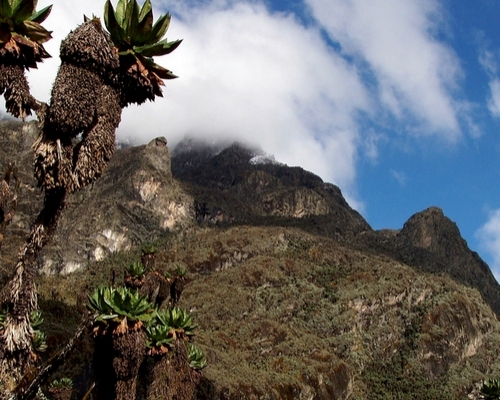 Over 199 species have been recorded on Mt Rwenzori. The bamboo zone on the mountain may reward us with the Handsome Francolin, Archer’s Robin-Chat, Cinnamon Bracken-Warbler, Mountain Yellow Warbler and Dusky Crimson-wing., Rwenzori Turaco and Shelley’s Crimsonwing, the rare Ruwenzori Nightjar and African Wood-Owl, Red-chested Owlet and Fraser’s Eagle-Owl are also possibilities. Others may include:localised Grauer’s Broadbill, the Great Blue and Black-billed turacos, the spectacular Yellow-billed Barbet, Black-tailed Oriole and mixed flocks of Slender-billed, Waller’s, Narrow-tailed and Stuhlmann’s starlings.,African Hill Babbler, Black-faced, Ruwenzori and Chestnut-throated apalises, Red-faced Woodland-Warbler and Cameroon Scrub-Warbler, White-tailed Blue-Flycatcher, Ruwenzori Batis, Mountain Sooty Boubou, Lagden’s and Doherty’s bushshrikes, Sharpe’s Starling, Strange Weaver and Oriole Finch. Flowering trees attract the incredible Purple-breasted Sunbird as well as Blue-headed and Regal sunbirds, Cassin’s Hawk-Eagle, Bronze-naped Pigeon, Cinnamon-chested Bee-eater, Cassin’s Honeyguide, Green-backed and Elliot’s woodpeckers, Petit’s Cuckoo-shrike, Toro Olive-Greenbul, White-chinned Prinia, Cassin’s and the enigmatic Chapin’s flycatchers, Mountain Wagtail….. The Rwenzori mountains, which are known internationally as ‘The Mountains of the Moon’, are a site of world-renowned aesthetic and scientific value, the most permanent sources of the River Nile, and one of the country’s (and indeed region’s)most vital water catchments on which greater than 500,000 people directly depend. Due to their immense altitudinal range, the mountains support an outstanding range of species, many of which are endemic to the Albertine Rift region, especially in the higher altitude zones. Also present are at least three globally threatened mammals, plus a potentially large number of undocumented invertebrates and plants. Because the park constitutes a small but significant element of one of the most extensive conservation zones in Africa (the transnational system of protected areas in the Albertine Rift region) conservation of the Rwenzori offers a unique opportunity to maintain a sensitive and extensive natural habitat intact (Howard, 1991).